I had the opportunity to see Mary Oliver speak a few years ago. This poet is a petite woman in her seventies. She walked onto the stage of a large concert hall wearing black jeans and a sweater and stood at the podium behind the microphone and began to speak. Mary Oliver is an introvert. She spends her days often alone in nature or writing at her desk. Here she was on the stage of a large concert hall at her “sold out event” to read her life’s work. She didn’t need to yell into the microphone to get the audience’s attention. Her presence was in her ability to extend her energy to meet the audience and she filled that space. You could hear a pin drop when she began to speak. -Exhale slowly. Allow your exhale to be longer than your inhale. -Repeat. 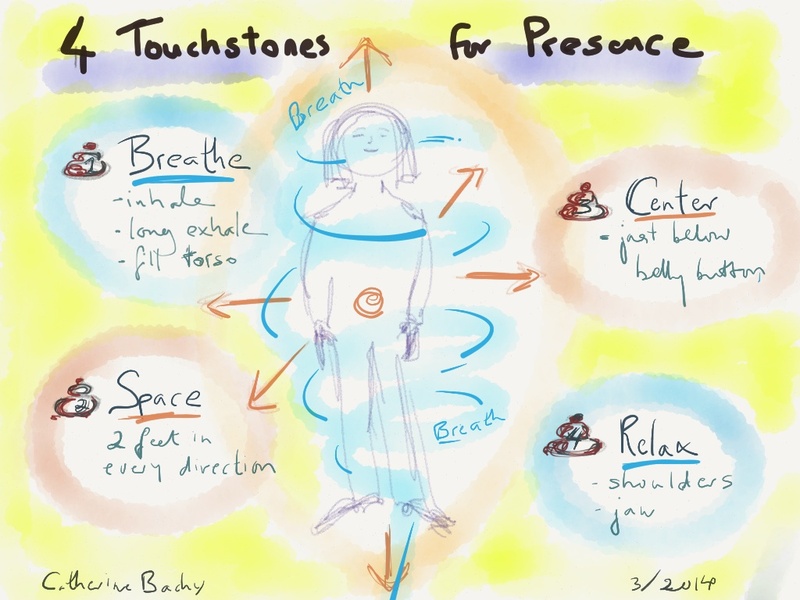 Inhale and Exhale slowly three times, each time expanding your belly more and exhaling slowly, sensing your breath go all the way through your body and connecting you with the center of the earth. 2) SPACE: Take up More Space. See your physical space as stretching two feet all around you: in front of you, behind you, to either side of you and above and below you. 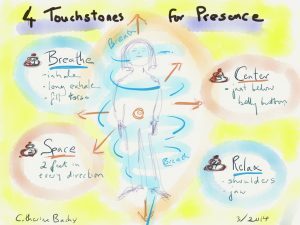 Your presence is not limited to the envelope of your body. 3) CENTER. Drop your attention to a spot about an inch below your belly button. If it helps you, place a hand gently on that spot as a reminder of your center. Imagine that this place is your home base, your base camp before a long climb. Get to know this place and return there often. It’s always there. Begin or reinforce these practices now. Don’t wait until you are on stage to check your cheat sheet! Daily practice now will help your body remember what to do when the spot light is on you!